I have to admit that, after the first playthrough, I thought there was too many rules to remember. However, after my second playthrough I found that the game was much easier and I had grasped the basic concepts, so I was no longer having my head permanently buried in a rule book. Even my seven-year-old daughter had grasped many of the major concepts (she was playing along with me). Hearing her say, “Dress lines…crap!” was priceless. In short – quite well. It does give a feel for 18th Century wargaming, and offers up some really interesting tactical considerations for armchair generals. 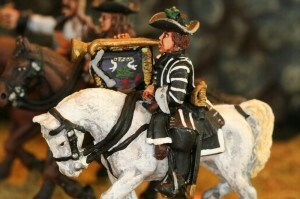 For example, cavalry has been classified as “trotter” (those that deliver a charge home) and “mounted fire” (those that engage the enemy with firearms, but can also deliver a less effective charge than “trotters”). Infantry units are not easy to manoeuvre and require you to do a little planning. Also, artillery are not as effective as they were in say the Napoleonic period as they fire in sections which makes it harder to cause casualties unless you are close range. It takes some getting used to, but is great fun. Now that I have grasped the essential rules, I began creating a scenario. After all, I want my battles to be interesting and have a point. Initially, I was tempted to head to Caliver Books and buy a couple of Charles Grants “Chiraz” series, that are essentially ready made 18th Century wargame campaigns. However, I also own two scenario books by the same author, as well as a large collection of his tabletop teasers, so I thought I could pull something together by mining this rich vein of inspiration. Sure enough, I quickly set my heart on a scenario that sees one side attempt to seize a bridge, while the opposing side attempts to destroy it. Once I had tweaked the scenario a little, and added a little Cartouche flair, I was happy to test it out. That scenario will be the subject of a future post. Now I am just hoping that tomorrow sees the delivery of my Wargames Factory WSS Infantry (I have four boxes in the mail) so I can start assembling the forces.